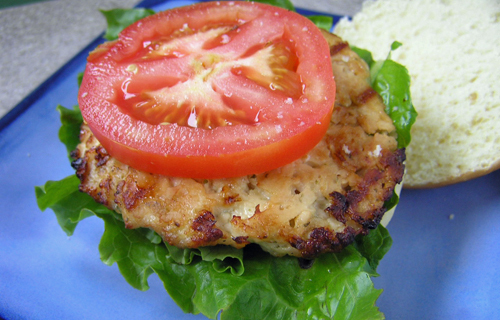 Ground chicken breast is mixed with diced cheddar cheese and seasoned to form the perfect Chicken Cheddar Burger. Add in bacon and you have the ultimate; the Hill’s Home Market Bacon and Cheddar Chicken Burger. What a great alternative to a regular burger! Grill: Adjust the grill so that the burgers are 6-8 inches from the coals. Grill approximately 10-12 minutes on each side, turning once halfway through. Broiling: Preheat broiler. Top surface of burger should be 3 inches from heat. Rare, 8 minutes. Medium, 12 minutes. Well done, 20 minutes.